Written on October 25, 2008 at 7:40 pm by Air Coole VW Love! If you are reading this then chances are that you either own an air cooled Volkswagen or you want to. No one can blame you for that! Classic air cooled Volkswagens are the best cars on the road! If you are thinking of getting yourself an old VW you have to decide which type and how much money you can spend. Beetles are the easiest and lowest priced VWs you can get as long as you aren’t particular about the model, however they still aren’t cheap. Whether you decide you want to own a bug, bus, karmann ghia, or other VW you will next need to know your price range budget. If you can afford it and you just want to have a nice car right now then shop for one that is in excellent condition. Many people prefer to buy a cheaper car that is a “fixer upper” because they enjoy crafting and restoring an air cooled car back to life. Before you decide to buy a “fixer upper” look deeply into yourself and ask “Will I actually do this work?” If your honest answer is yes then by all means buy that VW and fix it up. The first air cooled Volkswagen I owned was a green 1974 Super Beetle. I traded an old truck I had around $300 in for the bug. The Super Beetle wasn’t running very well and the owner didn’t know how to fix it. He said that he wanted the truck. Before I agreed to make a trade I looked over the car. The body did have some rust and dings, but it was in pretty good shape as was the interior. I didn’t have a compression gauge, but I suspected that was where the problem was. I removed the spark plugs and blocked each hole with a wad of paper then I cranked the engine. I walked back to take a look and in cylinders 1 and 2 the paper wad was still there in the hole. The compression for those two jugs wasn’t enough to blow the paper out! I knew right then that I was going to be in for a ring job, maybe more. We made the trade and when I drove that VW Beetle home I made no more than 25 mph. On some of the hills I would be in first gear barely crawling along! As soon as I got the bug home I ordered a set of rings and some tune up needs and started on the job of pulling out the engine. A few days later I was back on the road and I am sad to say that I got the first speeding ticket of my life. That Beetle would do 75 and 80 mph with no problem and could take most hills with ease. Another time I was approached by a man who wanted to sell me an old Bug. He told me that the body was in good shape but the engine wouldn’t start and he only wanted $100. Naturally, I had to go take a look at it. The VW Beetle had been sitting in a barn on the back of a farm. Even though it was covered with dust it was still a beautiful car. At that point I already knew I wasn’t going to be passing it up at that price regardless of whether or not it even had an engine! He put in a battery and the engine turned normally, but it would not fire. I started asking him questions while I was looking the car over. He told me that he had driven the car for about a year and even though he had kept it tuned up it kept running worse until eventually it wouldn’t run at all. It had been stored in the barn for more than a year. I asked him if he had ever adjusted the valves, he said that he never realized you had to do that! I told him it was probably just the valves, but he just wanted rid of it. I bought the car from him and asked him if I could come back later to work on it. A couple days later, after we had gotten the paperwork done, I had a friend give me a ride out to the old barn and quickly adjusted the valves. The old Beetle started right up and I drove it home. The previous owner had never adjusted the valves even though he had kept up with other parts of the tune up. He replaced plugs and wires, distributor cap and components and changed the oil regularly, but without the valves being adjusted the engine’s performance steadily decreased. In the end the valve clearances were so excessive that the valves were not able to be fully opened. Written by David Slone, Copyright 2008 all rights reserved. hey my name is david, u just helped me out with my beetle! i bought a 72 beetle, i had a 72 super bug afew years back,and loved it, i had to get anouther when i saw an orange one on craigs list. 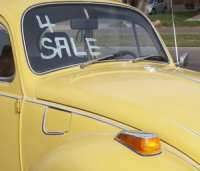 it had a rebuilt 1600, good lights, alittle rust and some dings, but its a fine beetle for $2000.i gave it all the other parts in a regular tune up, but it still won’t idle! the bug idles afew secondes then sputters to death, also theres a small smell of gas around the car after its been drivin.could my valve clearance be the colperate? idk but im going to check them. I have a 72 super and i’ve had the same problem you guys are talking about. it will idle fine for a few minutes then it sputters and eventually dies. if i keep my foot barely on the gas pedal it stays running. i’m at a loss as to what the problem is. let me know if you guys figure something out. David,rmk and Austin- what I see that all of you have in common is that your VW’s are probably all using a Solex 34 PICT3 carb. These are very troublesome carbs if the car has been left sitting for a long period of time. Try this- Using the proper flat blade screwdriver try adjusting the bypass valve. It is the large brass screw that is located on the throttle linkage side of the carb just above the electromagnetic cutoff valve (a dark colored cylinder with a wire going to it) This should give you some adjustment of your idle. If you can’t make a difference you will probably need to rebuild the carb. Be warned that they are quite difficult to rebuild. Google ” rebuild solex 34PICT3 for assistance”. I have a 72 Super beetle, the problem Im having is the car will idle all day long, but the min. you put it into gear and give it gas to go the car dies. or you can be going down the road and the next thing you know the car dies. My Husband has rebuilt my carb. yes its the solex 34 Pict-3 I still have this issue. oh yeah I have new spark plugs, wires, cap and rotor. Is there any help for my Herbie the love bug. On the 1970 through about 1974 VW bugs there is a large solenoid on the left (driver’s) side of the carburetor that controls idle speed. It frequently goes bad. It is larger around than a quarter and about 2 inches long. The electrical coil in it fails and won’t pull the plunger back to allow the idle circuit in the carburetor work. If the car dies when you put it in gear, you have the back-up lights wired to the wrong side of the ignition coil. the fuel line and chokes the engine. One more thing–If the car dies when you step on the gas pedal you probably have a plugged accelerator pump nozzle. Take the air cleaner off, with the engine off, and look down the bore of the carburetor. Then pull the accelerator lever with your left hand while looking in with a flashlight. !NOT with a match or lighter, fool! You should see a small brass tube spray gasoline down the throat. Sometimes the brass tube will be missing entirely and will have to be replaced. If there is no spray, the four-screw square cover on the side of the carburetor may need to have a new rubber piece installed just under the square cover. I also have a 72 beetle, it runs great but i recently moved from san diego up to salt lake and my engine has begun to over heat pretty frequently, im wondering if i need to tune my carb for the higher altitude, any feedback on this would be much appreciated. I’m no expert, but at higher altitude there is less oxygen per unit volume of air. It is likey in my eyes that if your car was running perfectly before, it will now be running rich and so you would want your to adjust your carb to take in more air. As the pressure is lower, the cooling effect of the ambient air will be less. You may want to look into it. Like I said, I’m not an expert just an engineering student. I don’t own a bug or anything aircooled. I am looking at 74 vw thing….looks good, told it runs well. I am a VW novice. Any hints or advice when I take a look at it? any issues or potential pitfalls? For cold weather also check the fast idle cam travel limit pin. What? On the left side of the carburetor is a little floppy thing, almost triangle shaped with a curved side and a side that has little teeth on it. There is a slot in this cam, and there should be a little roll pin through the slot and into the body of the carburetor. This keeps the fast idle cam from spinning around too far when the choke engages on cold mornings. That pin often falls out. You can go to a machine tool supply house and buy a replacement pin that is very slightly larger than the hole the other one fell out of. Just ask for a “roll pin”, but of course there are thousands of sizes. Parts places will know what a roll pin is. I’m interested in vw beetle bug but can’t decide cause hav never ownednor been exposed to them before. can someone assist me now! bug r a good start for a project , but need to be as complete a car as u can find. unless you like spend lots of funds, perts are ez to find and still aforable, i have a 1966, daly driver, needs some luv but so do i hehe good luck…. To me, the most interesting part of inter-mingling with VW Beetle owners’ is that each has a sad, hilarious and amusing story to share. And mine is no exception. I bought an exceptionally cheap 1973 German version of the VW Beetle 1300 in April 2008. Just like any would-be car owner I had to check out on its condition. I test-drove it and though the engine appeared to be running smoothly on both idle and cruising speed, the body was in a very sorry state with numerous dents and dings ( both large and small ) all over, one can visibly see through the holes and cracks on the floorpans the broken lines painted on the highway, the generator was not totally functioning and I had to rely on a fully-charged battery to keep going, the steering wheel had clearance plays rendering proper handling impossible, the sparkplug cables had cracks on them and the sparkplug themselves, as well as all the tires were of different types and makes. it was good the weather was cooperative because the wipers were not functioning either. But despite all of these, and since I love the challenge of bringing a near-dying car back to life, I eventually bought it just the same. Now the next task of negotiating more or less 100 kilometers of both smooth and rough roads to bring the Beetle home. At first, I drove it at around ( I said around because the speedometer was not functioning, either ) 40 KMS. //hour and after, say 40 KMS., had decided to increase the acceleration to around 60 KMS./hour; and as I gradually gained confidence in this small machine, accelerated to higher speed. At last I reached home and got some flaks from people for having settled with this old thing. But a Beetle enthusiast would just take any criticism with a grain of salt. Eventually, after having tried four impostor Beetle mechanics, I finally finally hired somebody who really knew his craft ( up to date the same mechanic maintains my “baby” ). Now it is colored Metallic Tivoli Blue and is now a far-cry from the one I purchased in April 2008. I had to rebuild the engine and had to change unserviceable parts and equipped the car with a header exhaust system and it runs like Beethoven’s masterpiece. I have a 72 Super Beetle with a 74 bus engine in it, a 1800cc. It’s my first VW, so is the valve problem in all VWs or is it the bugs? I have decent power but it doesn’t feel like enough for a stripped down bug. I also need a tune up but I read that you need to know if it’s a federal or California engine, how do you tell? Thanks! I’m and old and sort of elderly VW fan, I’ve had a Campmobile, a Bus, a Vanagon and 3 different beetles when I was young and fun loving. Now I’ve found a 74 Super and restoring it is both a labor of love and frustration. We drove it home and it ran great but needed a lot of TLC. We cut out and replaced the front lover pan gasket, replaced the front steering dampener and box, stripped out the interior restored the seats and replaced the carpeting, freed up all the cables, repaired the heat channels, removed all the chrome strips, sanded and repaired body rust and sanded and sanded. Then painted it in the original “safety” yellow, it’s Bright. Bead blasted the wheels and painted them bright red and put it back on the road. That’s when the fun started. We’ve cleaned and religned the fuel tank, replaced the fuel line front to back. Rebuilt and then replaced the fuel pump. Changed the fuel filter 6 or 8 or a dozen times. Rebuilt and cleaned the carburetor, oh, a lot I’m even getting pretty proficient. Discovered after it ate 3 sets of points it had a 6 v coil on a 12 v system, had 3/4 in reach plugs on domed pistons, really got lucky there nothing broke. And on and on we go -- it’s giving me grief now, missing and stalling; checked and reset the points. Checked spark plugs on 1 and 3, (the easy ones) they looked good. I’m about to start another round of tune-up and maintenance. But, it’s so much FUN!!!! If I were to buy a 1974 bug, for about $2,000 how much should I plan on spending to fix it up? If it runs well how much should I plan on spending per month to keep it that way? Thanks for any help you can offer. I bought mine for $1000, spent $1000 on redoing the seats, about $1000 on Misc other items. And hours and hours and hours and hours of work. But I didn’t pay a mechanic until I had it running and on the road. Now I have him look it over and set the valves at every oil change and still do sometimes a few and sometimes several hours of work on it monthly. But, it’s so much FUN!!!!! What if I were to purchase a 1974 VW bug, in great shape, but with no engine? How much does an engine cost? I will assume that you are using the appropriate gear. Have you had the compression checked? If you haven’t already done so I would recommend a complete tune up including valve adjustments and compression testing. To own a VW,is to love a VW. Have a 74 beetle w/rebuilt carb. runs excellent,but when stopping at light ect. the engine willnot idle/dies every time. made all kinds of adjustments. to no avail. Read my former posts about failure to idle. 95% of the time it is the electric solenoid cut-off valve that has failed. The purpose of the solenoid is to kill the engine when you turn off the key by choking the gasoline off in the carburetor. A quick fix is to remove the little wire, unscrew the solenoid, cut off the brass stem that has an aluminum plunger at the end. Throw away the plunger and screw the solenoid back in and reconnect the wire. You will now have to kill the engine by turning off the switch and then keeping the car in gear and letting out the clutch. This will buy you time until you can find and afford the new solenoid. To test the solenoid before surgery, turn off the key, disconnect the wire, unscrew the unit, reconnect the wire, have someone turn on the key (NOT START THE ENGINE!!) then touch the threads of the solenoid against the body of the carburetor or anything metal that is grounded. The solenoid should click and the plunger should retract. As I said, 95% of the time you will find it does not work. This was a major weak point on the pre-1975 models. You probably need new, quality, spark plug wires with new resistor ends on them where they plug into the spark plug. If you have replaced the distributor cap, you should have also replaced the rotor under the cap with the same brand as the cap. Never “clean” and regap the spark plugs. REPLACE THEM! If they are platinum plugs do not use a metal gauge but a plastic one. If you have platinum plugs you should loosen them and torque them back every tune-up interval. If you don’t they may weld themselves to the head and that is a major headache that requires helicoil brand tools and inserts to fix. If you own an aircooled, YOU MUST LEARN HOW TO ADJUST VALVES!! in the machine shop, you don’t have to have your valves or VW there!! I have a 1970 Beetle and I have changed the ignition coil, plugs, and unless I hold the pedal down some what my bug sputters out….What do I do???? I have a 1969 beetle and I cleaned the carburetor out and adjusted the timing. It starts and runs for a couple of seconds but after that it backfires and dies what do I do? Another cause for the problems you all describe could be the rubber boots on the intake manifold leaking air and leaning out your air fuel mixture. they can be changed without pulling the engine but I pulled the engine any way and wound up rebuilding the whole engine. Go figure.